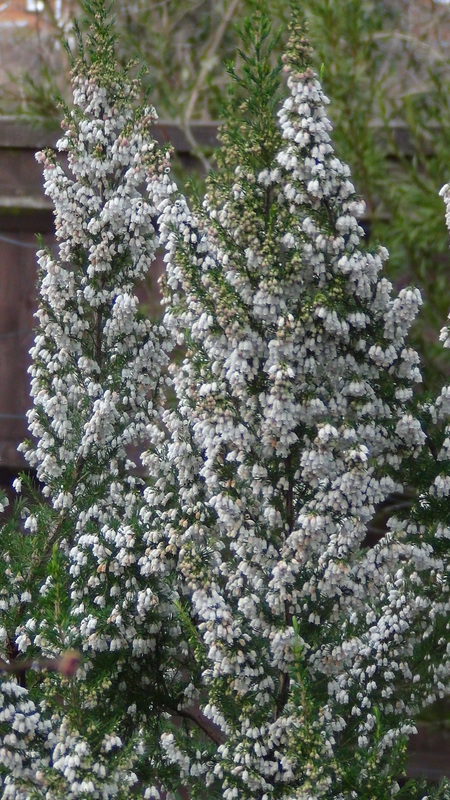 White flowers, XII–V, buts sometimes tinged pink; mid-green foliage; open erect habit; height to 1-4.5m; spread 61–75cm. Young shoots hirsute with simple, smooth hairs. Leaves in whorls of 4 (sometimes in 3s), linear to 7-0.5mm, light to dark green. Inflorescences usually numerous and crowded towards ends of shoots, appearing to form elongated panicles: 1-4 flowers in each terminal umbel at tip of short, leafy lateral shoots. Corolla white, often tinged pink in bud, narrow-campanulate to tubular-obconical, c. 5mm long. Stamens 8; filaments white, with microscopic hairs at base extending about a third the way up on sides and surfaces. Flowering in winter and spring (sometime from late autumn).